GALLIPOLIS — The main stage at the Gallia County Junior Fair was rocking Thursday night when the legendary Charlie Daniels Band took the stage. About an hour before taking to the stage, Daniels’ bus pulled into the fairgrounds off Jackson Pike with two escorts from the Gallia County Sheriff’s Office. Thursday’s performance was Daniels’ second in Gallia County; he also performed at the fair in 2010. Friday night’s entertainment on the main stage will be the Riverside Cloggers, followed by Two River Junction. Admission to to the Gallia County Junior Fair is $8, which includes rides and entertainment. Parking is free. For more information, visit www.galliacountyfair.org, or the fair’s Facebook Page. Legendary country music icon Charlie Daniels plays the fiddle Thursday night during his signature song, “The Devil Went Down to Georgia,” on the main stage at the Gallia County Junior Fair. 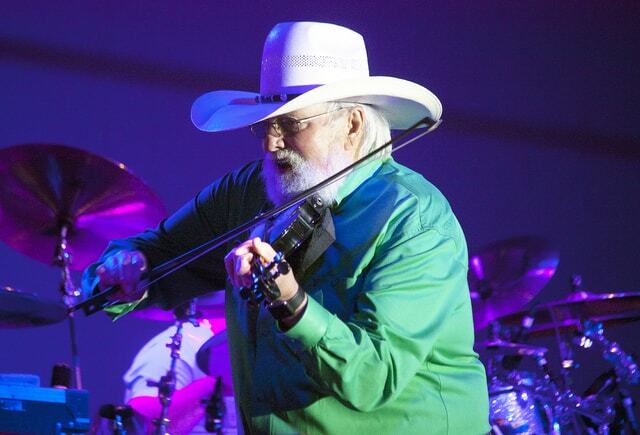 http://aimmedianetwork.com/wp-content/uploads/sites/42/2015/08/web1_DanielsMain3.jpgLegendary country music icon Charlie Daniels plays the fiddle Thursday night during his signature song, “The Devil Went Down to Georgia,” on the main stage at the Gallia County Junior Fair.